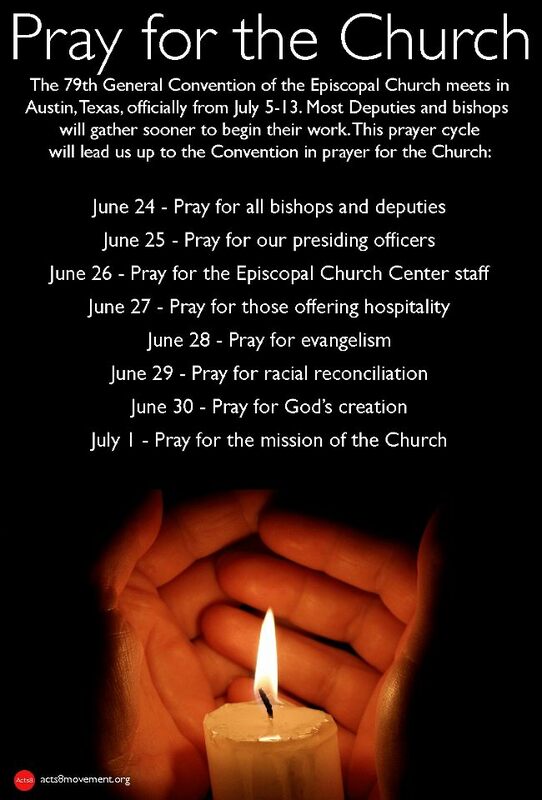 The Acts 8 Movement is inviting every member of the Episcopal Church to join us in an Octave of Prayer for General Convention. We hope you will pray at various times of the day, but especially at 5:08 pm. (The number 5 is for the 5th book of the New Testament, the Book of Acts, and 8 is for the 8th chapter). 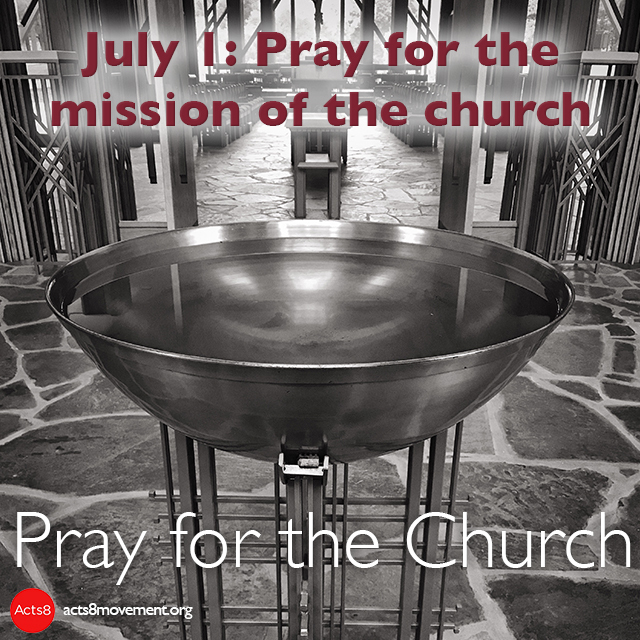 Today we pray for the mission of the church. 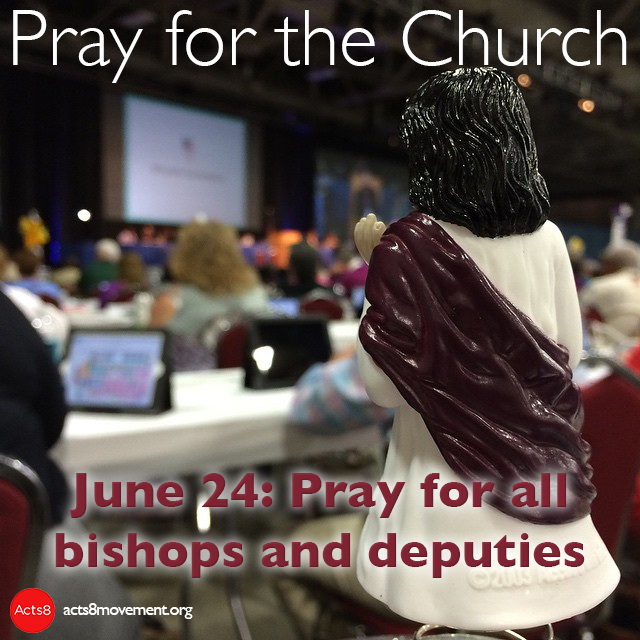 The Acts 8 Movement is inviting every member of the Episcopal Church to join us in an Octave of Prayer for General Convention. We hope you will pray at various times of the day, but especially at 5:08 pm. (The number 5 is for the 5th book of the New Testament, the Book of Acts, and 8 is for the 8th chapter). 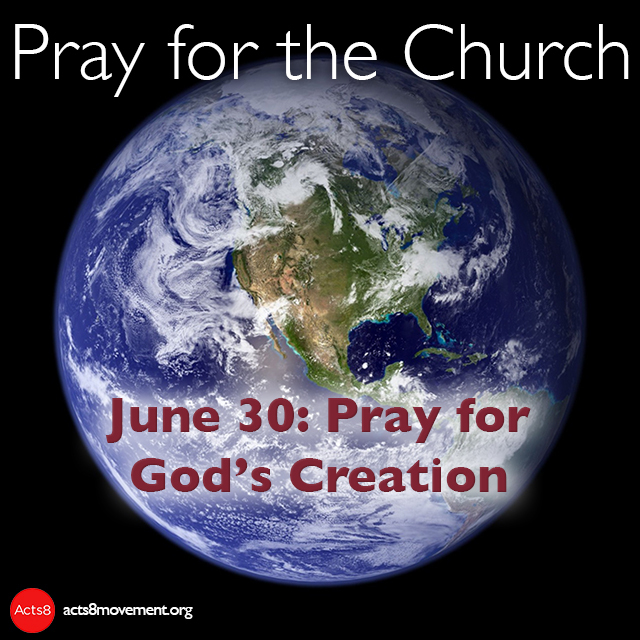 Today we pray for God’s creation. The Acts 8 Movement is inviting every member of the Episcopal Church to join us in an Octave of Prayer for General Convention. We hope you will pray at various times of the day, but especially at 5:08 pm. (The number 5 is for the 5th book of the New Testament, the Book of Acts, and 8 is for the 8th chapter). 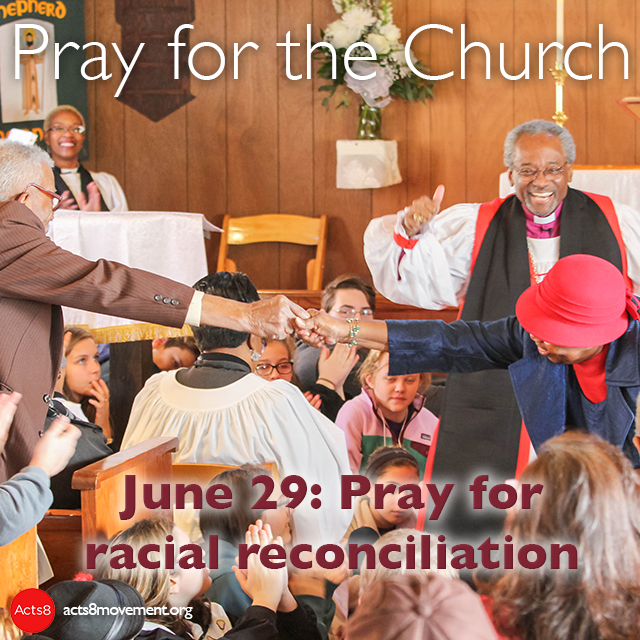 Today we pray for racial justice and reconciliation. 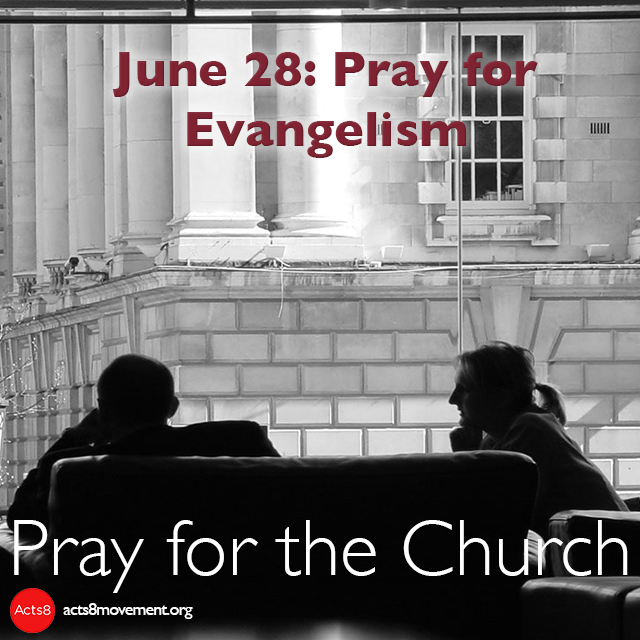 The Acts 8 Movement is inviting every member of the Episcopal Church to join us in an Octave of Prayer for General Convention. We hope you will pray at various times of the day, but especially at 5:08 pm. (The number 5 is for the 5th book of the New Testament, the Book of Acts, and 8 is for the 8th chapter). Today we pray for evangelism and our witness to the Gospel of Jesus Christ. The Acts 8 Movement is inviting every member of the Episcopal Church to join us in an Octave of Prayer for General Convention. We hope you will pray at various times of the day, but especially at 5:08 pm. (The number 5 is for the 5th book of the New Testament, the Book of Acts, and 8 is for the 8th chapter). 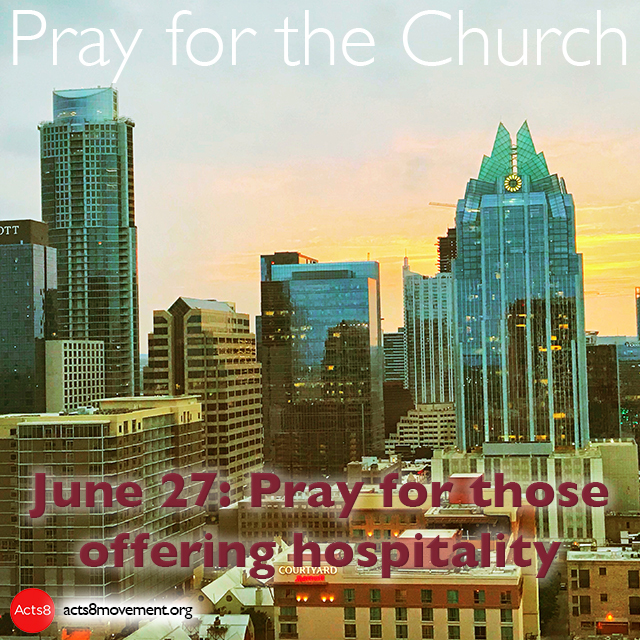 Today we pray for all offering hospitality at the General Convention in Austin, Texas. Heavenly Father, whose blessed Son came not to be served but to serve: bless all who, following in his steps, give themselves to the service of others; that with wisdom, patience, and courage, they may minister in his name to the suffering, the friendless, and the needy; for the love of him who laid down his life for us, your Son our Savior Jesus Christ. Amen. The Acts 8 Movement is inviting every member of the Episcopal Church to join us in an Octave of Prayer for General Convention. We hope you will pray at various times of the day, but especially at 5:08 pm. (The number 5 is for the 5th book of the New Testament, the Book of Acts, and 8 is for the 8th chapter). 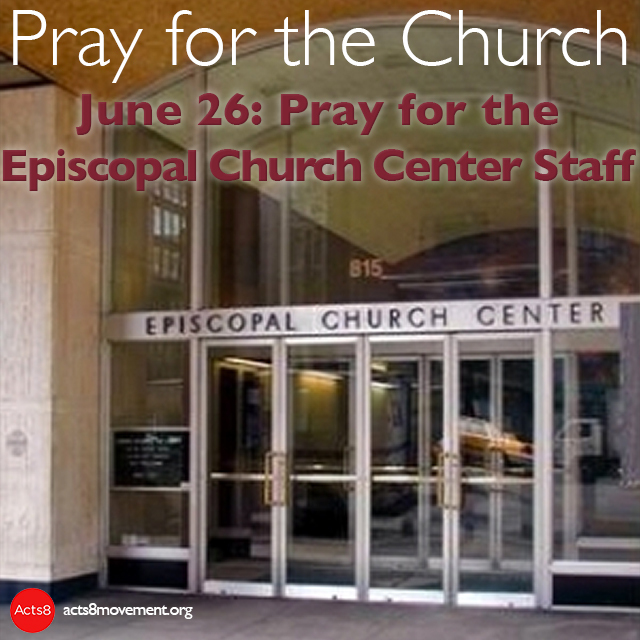 Today we pray for the staff of the Episcopal Church Center. Almighty and everlasting God, by whose Spirit the whole body of your faithful people is governed and sanctified: Receive our supplications and prayers which we offer before you for all members of your holy Church, and especially for the officers and staff of the Episcopal Church Center, who serve our church faithfully, that in their vocation and ministry they may truly and devoutly serve you; through our Lord and Savior Jesus Christ. Amen. 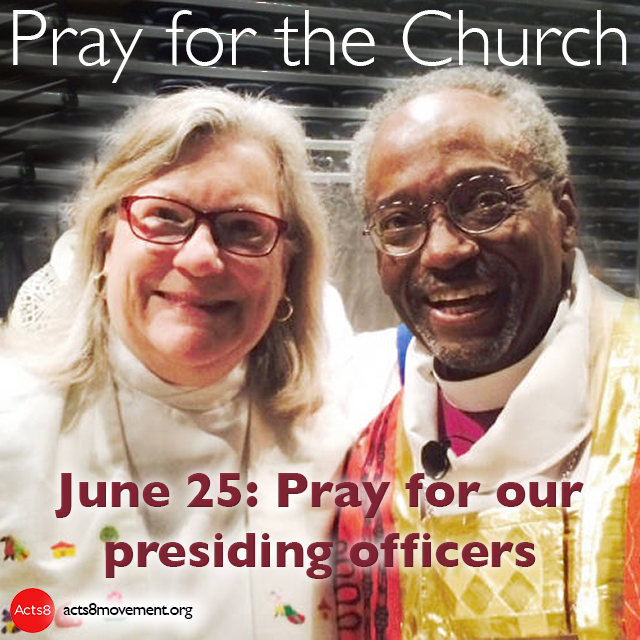 The Acts 8 Movement is inviting every member of the Episcopal Church to join us in an Octave of Prayer for General Convention. We hope you will pray at various times of the day, but especially at 5:08 pm. (The number 5 is for the 5th book of the New Testament, the Book of Acts, and 8 is for the 8th chapter). Today we pray for Presiding Bishop Michael Curry and President of the House of Deputies Gay Jennings. Almighty and everliving God, source of all wisdom and understanding, be present with those who take counsel in the 79th General Convention for the renewal and mission of your Church. Teach us in all things to seek first your honor and glory. Guide us to perceive what is right, and grant us both the courage to pursue it and the grace to accomplish it. We pray especially for the leadership of Michael, the Presiding Bishop, and Gay, the President of the House of Deputies, that they may exercise the ministry of leadership wisely and faithfully; through Jesus Christ our Lord. Amen. The Acts 8 Movement is inviting every member of the Episcopal Church to join us in an Octave of Prayer for General Convention. We hope you will pray at various times of the day, but especially at 5:08 pm. (The number 5 is for the 5th book of the New Testament, the Book of Acts, and 8 is for the 8th chapter). Today we pray for all deputies and bishops. O God, the fountain of wisdom, whose will is good and gracious, and whose law is truth: We beseech you so to guide and bless our deputies N. and N., our bishop(s) N. [and N.], and all deputies and bishops, that they may make wise decisions and enact faithful resolutions that please you, to the glory of your Name and the welfare of this Church; through Jesus Christ our Lord. Amen. The full calendar and suggested prayers can be found below, but each day we will provide on our Facebook page (facebook.com/Acts8Movement) and website (acts8movement.org) these prayers alongside images that are suitable for sharing. The Acts 8 Movement is a Missionary Society of lay and clergy members of the Episcopal Church whose mission is to proclaim resurrection. Read about the Acts8 Moment here. 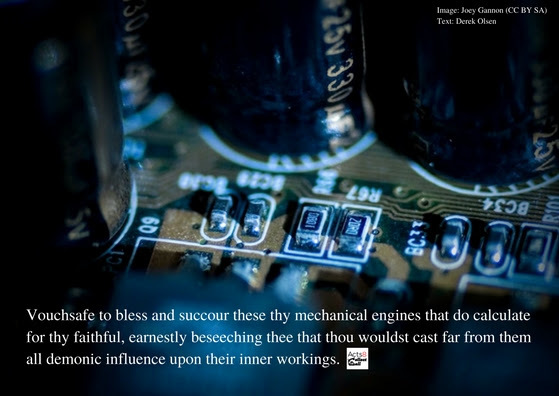 One of the things the authors and revisers of the 1979 Book of Common Prayer could never have anticipated was how, nearly 40 years on, the technology replacement cycle would become a pervasive, painful feature of the lives of the faithful. Two weeks ago, Holli Powell, co-host of The Collect Call podcast, faced an ailing laptop. Finding nothing in the Prayers and Thanksgivings or Burial of the Dead sections of the prayer book to ease her despair, she and co-host Brendan O’Sullivan-Hale appealed to their listeners for a new collect. Listeners delivered! The submissions we received combined an ancient form of prayer with modern #firstworldproblems. We hope these prayers help you turn your mind to higher things next time your laptop crashes. To aid you, we’ve also combined selected words with images, in homage to the prayers The Episcopal Church posts on Facebook, Twitter, and Instagram daily. 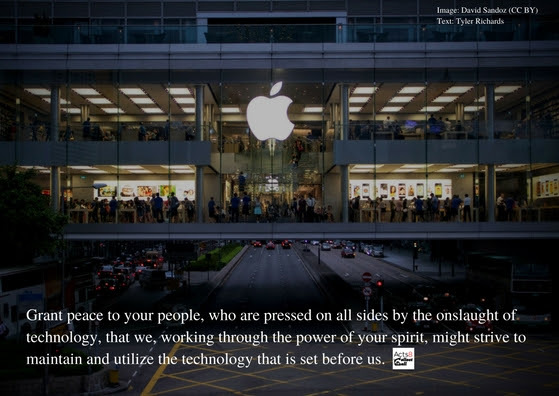 Grant peace, O merciful God, to your people, who are pressed on all sides by the onslaught of technology, that we, working through the power of your spirit, might strive to maintain and utilize the technology that is set before us; through Jesus Christ our Lord, who lives and reigns with you and the Holy Spirit, one God, for ever and ever. Amen. Image credit: David Sandoz, distributed under a CC BY license.